NOTES: Includes photo etch parts. In the early 90's China developed its first third generation design, theType 90-II prototype series. The Type 90-II was developed by studying theT-72 tank. The Type 90-II's features included a 125mm smoothbore cannon with an autoloader, modular composite armor and a centered driver position. 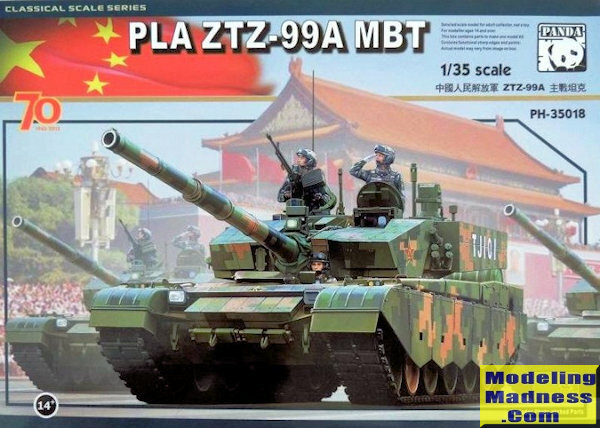 While the Type 90-II series ultimately did not enterPeople's Liberation Army (PLA) service, it saw success as an export tank and was also built under license in Pakistan as theAl-Khalid. The Type 98 or WZ-123 was China's domestic Type 90-II derivative. It was first seen in rehearsals for the 1999 National Day parade and was officially revealed on 1 October 1999. It sported a distinctive appearance with the hull and crew layout similar to the Russian T-72 but with a welded angular turret more similar to Western designs. When the tank went into service it was renamed the Type 99. According to military information website Global Security, the Type 99 has a lengthened T-72 hull. An updated Type 99 model was officially introduced at the 2015 Victory Day Parade as the Type 99A. This variant had previously been used by PLA troops during theShanghai Cooperation Organization (SCO) military exercises in 2014. Although the PLA has not distinguished between this variant and older models, some sources have named this latest variant the Type 99A2. The Type 99A is an improved Type 99. Prototype testing was underway by August 2007 and believed to be the standard deployed Type 99 variant in 2011; upgradable from Type 99. The improved main gun may fire an Invar-type ATGM. It mounts 3rd generation (Relikt-type) ERA, and an active protection system. Has a new turret with "arrow shaped" applique armor. The larger turret may have improved armour and a commander's periscope, and the tank may have an integrated propulsion system. Has a semi-automatic transmission. By 2008, 200 Type 98 and Type 99 tanks may have been deployed to theBeijing andShenyang Military Regions. The Type 99 has seen less deployment than other tanks in PLA service due to cost factors. Panda molded this in the tan plastic one is so used to seeing in its other armor and similar kits. The molding is excellent and fully up to the specs of the day. One thing that makes itself apparent is that this is not a small vehicle. I dare say it is near the size of the M1, which means it will take up a bit of shelf space. In line with other modern MBT kits, there is considerable attention paid to the suspension of the vehicle. This one requires the suspension attachment points to be glued in place and there is the usual bevy of road wheels (six pairs per side) a nicely done idler and sprocket. A few of the photo etch bits are needed for the lower hull. The real work comes when building up the tracks. There is no denying that individual track links look a ton better than link and length or single plastic/vinyl band tracks. However, they can also be quite time consuming to build up. The ones for this tank take up four large sprues. Not only that, but there are four large sprues that make up the track pads (two per track). Once those are attached, the rest of the build will concentrate on the upper hull and turret. The majority of pieces for the upper hull are large and consist of fenders, side skirts, and bits that fit on the upper hull. This is where the majority of the photo etch is used, and a lot of those bits are screens and brackets. The photo etch is not onerous and is used where this material is appropriate. Panda has molded the gun barrel in two halves and this is then trapped between the upper and lower turret halves. There is no breech detail so while you can pose the turret hatches open, you'll need figures to put in them as there i no turret interior detail. Large appliqué armor sections surround the turret. A nicely detailed machine gun and its mount is also included. Once all the vision hoods and various sensors and sights are added to the upper portion of the turret, it looks properly busy. 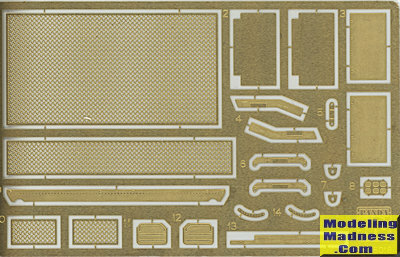 Instructions are well drawn and typical of armor kits, offers no painting information. All of that is left to the color and markings guide. The decals are not shown as white markings on a white background are nearly impossible to scan. You get PLA insignia and a variety of numbers to make whatever tank you wish. 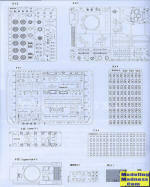 There is a diagram showing a formation of 19 tanks, each with a different number, to help you in this area. All the tanks have the digital style camouflage which is popular in many armies. This will require some skill in masking to duplicate, but will be very impressive when done. I have been told that there are paint masks for this kit so that should be a huge help. All the tanks look like the one on the box art. 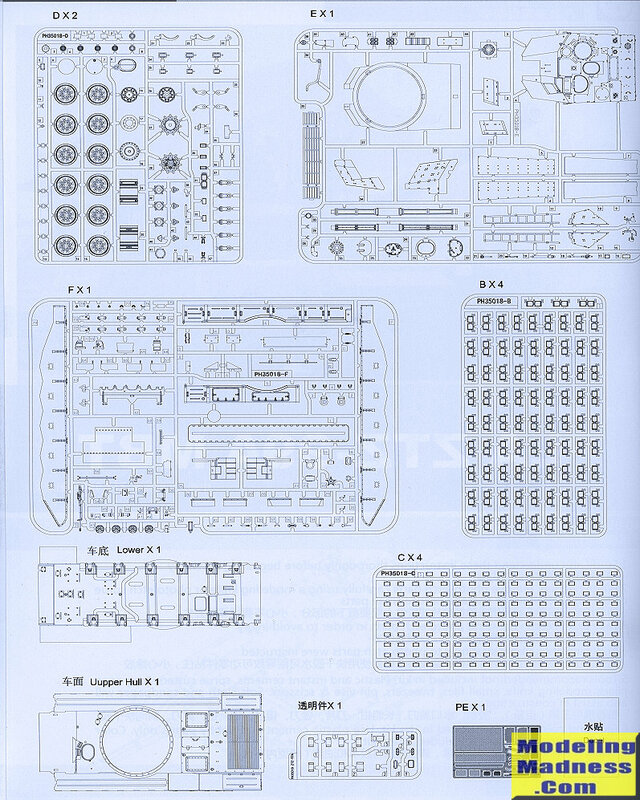 I have to say that I am continually impressed by the quality and detail that Panda Hobbies puts into its kits. They pick interesting subjects and I would think that the kit builds as nicely as it looks in the box.Interestingly, I rarely see any PLA armor being built. Odd since the PLA has such a huge army, but perhaps it is the camouflage schemes that are daunting. Like anything else, it can be done and one will have something one rarely sees when done. Thanks to Glen Coleman and Panda Hobbies for the preview kit. This one should be on your store shelves.